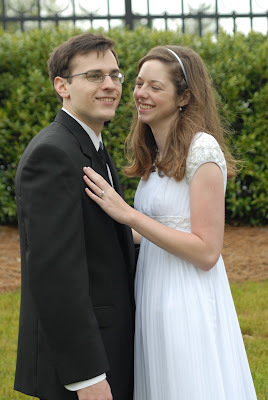 I know that some people may consider it completely cheesy and cliche, but I'm making Goals for 2009. I've actually been thinking about these goals for a while, and the fact that I'm committing to them right before the New Year is a coincidence. Goal 1: Make all A's in school this semester. Not that I haven't tried to get good grades while I've been in college, but I certainly haven't tried very hard. I was content with the thought that I could do very well if I put my mind to it, only I haven't put my mind to it since my freshman year of high school. And I feel like that's not good enough any more. So my goal is to do better. Specifically, my goal is to get straight A's. Goal 2: Read all the books on my "to-read" list. Right now I have sixteen books on the list, some of which I have lost interest in reading, some of which I have been meaning to read for several years, and some of which have gotten excellent reviews from all the people whose literary taste I respect. I have neglected them all so far, but I intend to read them all in 2009. In fact, it seems like I have too few books on the list. You can check out the list on goodreads.com, and feel free to suggest a book in the comments section (I'll take suggestions for another week before the list is officially closed). Goal 3: Wear my retainer every night. I've started to work on this goal already, and it has not been easy. I stopped wearing my retainer a few weeks after Christian and I got married, and after a while I forgot about it, and then I was cleaning up in our room one day and I found it, but I didn't start wearing it again for so long because I was afraid. Afraid of the pain. Anyone who has had a retainer that they left off wearing for even a few days (so basically, everyone who has had a retainer) has an idea of the pain that I've been experiencing the last few nights. Only, I haven't worn my retainer for eight months. It's awful. Still, I'm committed to wearing it every night. Goal 4: Maintain regular personal scripture study, journal writing, and morning prayers. Personal scripture study will be more enjoyable since Christian got me new scriptures for Christmas. I always love new scriptures that haven't been marked up yet. I also recently gave up on the old journal that I've been writing in for years (with the excuse that that phase of my life is over, and it's weird to write about my life with Christian in a journal in which I also wrote about the crushes I had on other guys), hoping that a new journal would entice me to write more often. So far, it hasn't worked as well as I would like. And I tell you what, I have the worst time in the world remembering to say my morning prayers. I know it's something that's very important, but it's something that I've never gotten the hang of. I really need to work on that. Goal 5: Watch the entire Seinfeld series. Christian has them all on DVD; it shouldn't be too hard. I hope that everyone had an awesome Christmas. Christian and I had tons of fun. We got all kinds of presents and good chocolate candy, and we saw a lot of family. I think we might have seen everyone in the world to whom we're related. We also did a lot of driving between Raleigh and Clayton and Morrisville, which was tiring, but it was worth it. I think my favorite present from Christian was new scriptures, because they're really cool and they snap and they have my name on them. Christian's favorite present from me was Die Hard, which I got him edited on DVD. 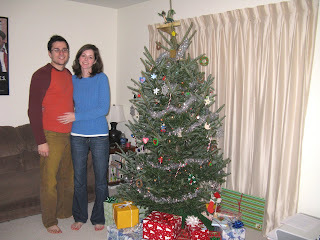 Here's us on Christmas Eve night: Also, I don't know if everyone knows this, but Christian is getting old. 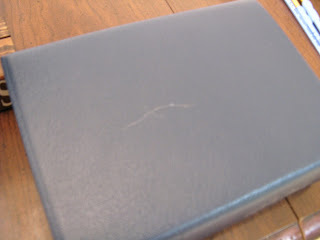 When we were in church on Sunday, I was playing with his hair in Sacrament Meeting, and I saw something, so I plucked it out of his head, and it turns out that it was.... drumroll... a gray hair. I was stunned. Christian kept it and brought it home, and I took a picture of it: I told him it might be a fluke hair, because my mom has found bright red hairs in my head before, so maybe it doesn't mean anything. On the other hand, maybe Christian will be gray before he turns 30. Christmas tree decorated, tree topper chosen, presents bought and on their way, Christian and I only had a few more preparations to make before the big day. First, we needed stockings. 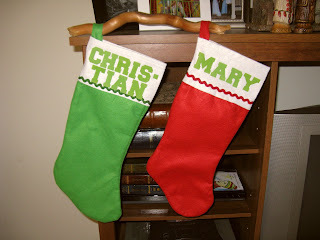 I got some for $0.99 each at Target -- a red one for me, because that's my favorite color, and a green one for Christian, because that's the other Christmas color. Christian said that we needed our names on them, so I suggested painting our names on with acrylic paint. Then I suggested writing them on with permanent markers. Then I suggested embroidering them on, with the stipulation that I'm not that great at embroidery. Then I suggested using some iron-on letters that I had leftover from when I made my "Potter for President" shirt for the release of Harry Potter and the Deathly Hallows. Christian finally liked the iron-on letters idea, so we went with that. After getting our Christmas tree, I was faced with another dilemma. 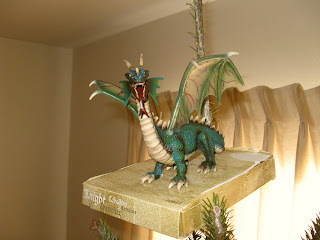 Growing up in my family, we always had a unique Christmas tree topper. When my brother was three, he made an angel in Primary. It was made of construction paper with white and orange yarn hair, with a frowny face colored on with black crayon. It was called the Mad Angel, and no offense to people who don't have awesome Mad Angels on top of their Christmas trees, but I was always proud to have it instead of something more glamorous. This year, I found myself Mad Angel-less, and I wasn't sure what to do. I didn't want to buy a star or a pretty angel. 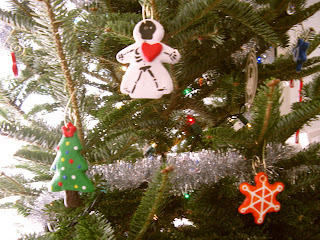 I wanted to carry on my family's tradition of unusual Christmas tree toppers. When I mentioned this to Christian, he thought for a second and then said, "How about a dragon?" And I said, "Perfect. Awesome." 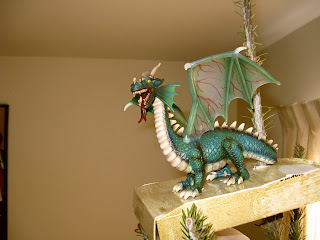 We weren't sure where we were going to find a dragon Christmas tree topper, but we knew we weren't going to get this one: It was the only one we found by doing a Google search for "dragon Christmas tree topper," but we quickly decided it was not for us. Not only was it made out of blown glass and 24-karat gold, but it sold on eBay for $89.45. Yikes. Fortunately, Christian had the idea of buying a dragon toy and then turning it into a Christmas tree topper. We found this guy at Target for $14.99. He's made of plastic and rubber. That's how we roll. So far, we haven't been very successful at the turning-him-into-a-Christmas-tree-topper part, mostly because we have no idea how to do it. Alice suggested cutting a hole in the bottom of his stomach, I think because she thought that he was made of soft plastic and that he was hollow inside. Not the case. Not soft. Not hollow. So that option's out, but this cardboard shelf thing cannot continue -- we need ideas on what to do. And maybe if someone loaned us their drill, that would be helpful. Also, we want to name him, but we haven't thought of anything great yet. We browsed this list of famous dragon names, but it didn't help very much. (Christian liked the idea of Prothero, but I'm going to talk him out of it.) Please leave thoughts or suggestions in the comments! 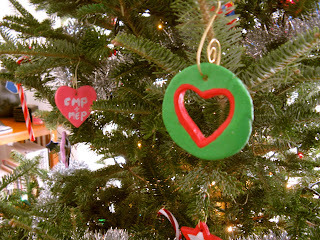 When it came time to decorate the Christmas tree, Christian pulled out a bag of ornaments that he's used for several years. He had some plastic candy canes, some grapevine wreaths with a scripture superglued on, crocheted stars, a bell made out of beads, a wooden block with his initials, a fuzzy Santa Claus, and sparkly snowflakes that shed glitter everywhere. However, we both realized that what he had would not be sufficient for our needs. For this reason, I bought cookie cutters and acrylic paint and whipped up half a batch of salt dough about three weeks ago. We've been working on them ever since; at this point, not all of them are done. For the sake of this post, I thought I'd go ahead and show off the best of them. I wish I took a picture of all the done ones before we put them on the tree, but I'm not really great with the thinking ahead, so I didn't. Christian made an ornament for each of his teams, including the New York Mets and the Indianapolis Colts (none for the Arizona Somersaults, however). 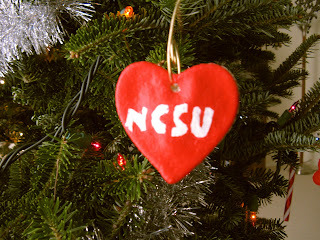 Here's his NC State ornament: He also got creative with the gingerbread men that I baked. He painted Superman and Elder Plautz before making an actual gingerbread man. 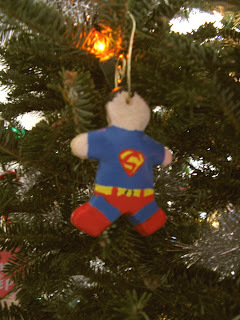 Superman is up on the tree for now, but he really needs a cape before he's finished: Here you can see a Christmas tree Christian made, an orange snowflake I painted (I also made purple, blue and yellow), and my ornament of me. I had gingerbread man and gingerbread woman cookie cutters, so I made one of each to be Christian and me, and then put a tiny heart on top before baking. When it came time to paint mine, I painted a skeleton with a red heart. When my mom saw it, she said, "But it doesn't look like you." I said, "It looks like me on the inside." Be aware that this is the first of several Christmas-themed posts. I meant to post about Christmas preparations as they happened, but I've been putting off posting for forever. 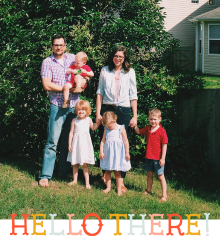 First I put off posting because of finals, and then I put it off because I was so enjoying having my husband at home all day (Christian took this whole week off of work). 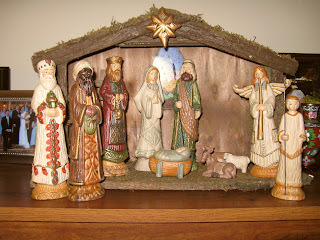 But I feel the time has finally come to post about Christmas, because today is Christmas Eve, and no one wants to hear about Christmas preparations after Christmas. And now I have so much to share. Possibly too much to share. Possibly it's too much and I won't be able to post about it all today. We'll see. The first thing that Christian and I did about Christmas was to decide that it's awesome, and we're totally excited because it's our first Christmas together ever. 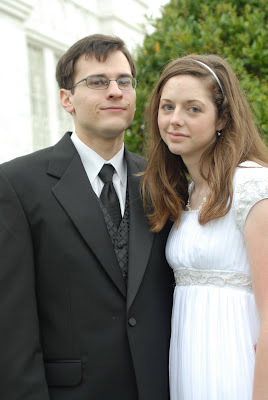 (We were dating last Christmas, but that doesn't count as our first Christmas, because we weren't grown-up married people then.) Then we started buying each other presents. Then we talked about when we would spend time with which relatives. Then we had the discussion about the Christmas tree. Christian wanted to use the artificial tree his parents gave him, and I wanted to buy a real tree, because I love real trees and how they smell. 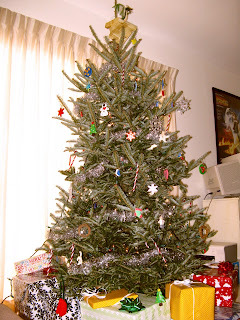 At the end of our discussion, we decided to get a real tree, and it is gorgeous. I love love love it. We also had to buy a Christmas tree stand, and a Christmas tree skirt, and then it was time to think about ornaments. Ornaments, however, are a different post. 11.1: Having followers is cool. I like having followers. It makes me feel like someone extremely important. Become a follower by clicking on the "FOLLOW THIS BLOG" link in the right-hand sidebar. 11.2: When I start a semester of college, I think to myself, "All of these classes are way easy. Yeah, I have assignments due, but they're not due for weeks and weeks and weeks. I've got this thing in the bag." And I feel pretty good about myself. Then weeks and weeks and weeks pass by and I have only a few days of class left and I realize that I'm going to have to get up early and tell Christian to leave me alone and stay up late and work really hard or I won't pass anything. It's not a good feeling. Also, I feel like I could benefit from a few time-management lessons. 11.4: I feel like one of the greatest talents a person can have is the ability to laugh at themselves. Having a thin skin is overrated.